What a struggle naming this recipe. It started out as a breakfast pizza concept, but by the time I assembled it I realized that it should never be limited to brunch (although it makes an awfully tasty one). From there it was a hamster wheel of names that weren’t quite right: spring pesto pizza, healthy skillet pizza, make ahead pesto farinata, gluten free chickpea pizza. All accurate in a way, but none of them encompassed the points about prep and taste that have to be made in the title. Usually when I name a dish/blog post/recipe, I try to keep it short by thinking about what it would be called on a restaurant menu. You wouldn’t see acclaimed chefs listing off every ingredient in the dish name, so why should I? Well, turns out the internet is a little different than real life (ya think? ), and in addition to clueing you in to the form and flavor of the dish via the title, you probably also want to know about the ingredients or how the dish is prepared. And maybe the nutrition or time investment, too. So much to think about. I’ve covered what I can in the title. This one-dish meal is truly a pizza in form: crust, sauce, topping. 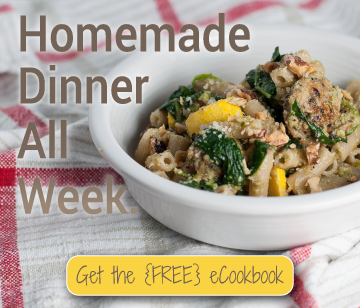 It’s spring-y, with a pesto of greens, fresh herbs, and sweet, spunky Meyer lemon (for which substitutions are explained in the recipe). The light tomato topping consists largely of spring onions or leeks, sautéed to enhance their sweetness. 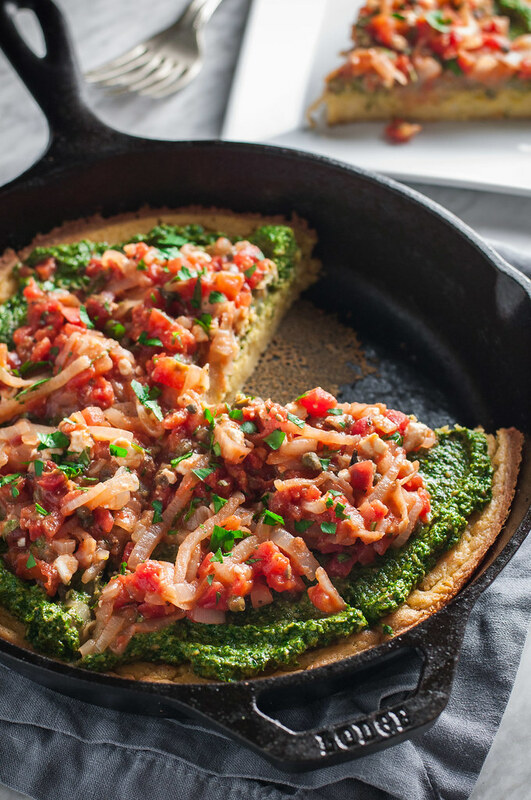 One of my favorite parts about this healthy pizza is that the topping is prepared in a cast iron skillet, my favorite cookware of late, then the crust is baked and the pizza assembled in the same pan. 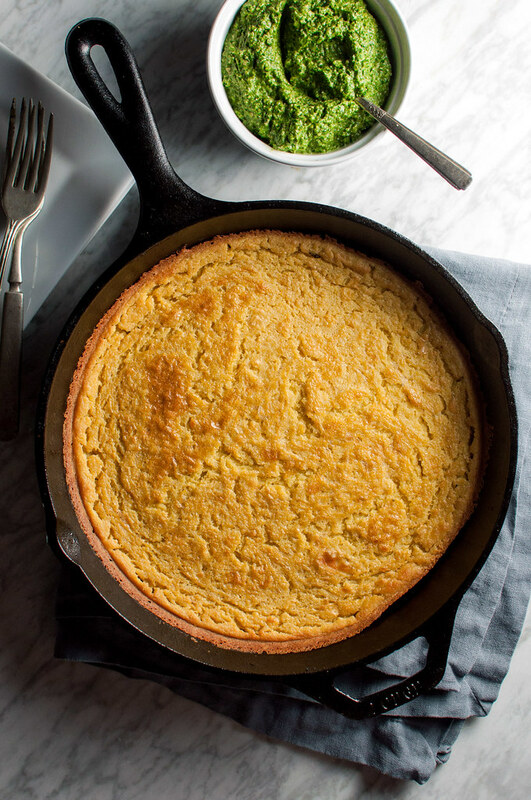 Finally, a deep dish, chickpea flour crust is earthy, filling, and flavorful. It’s inspired by a recipe I made on Easter for Italian farinata (which you might know as socca), and it’s both healthier and less messy than traditional pizza dough. True, no one will mistake it for a kneaded dough, but it has a smooth, creamy texture that’s simultaneously light and dense. Unlike some “healthier” pizza crusts, it’s totally sturdy and won’t crumble when you pick it up. If you’ve never used chickpea flour before, I just have to warn you that you may never turn back after trying this recipe, and then every other way of using it. 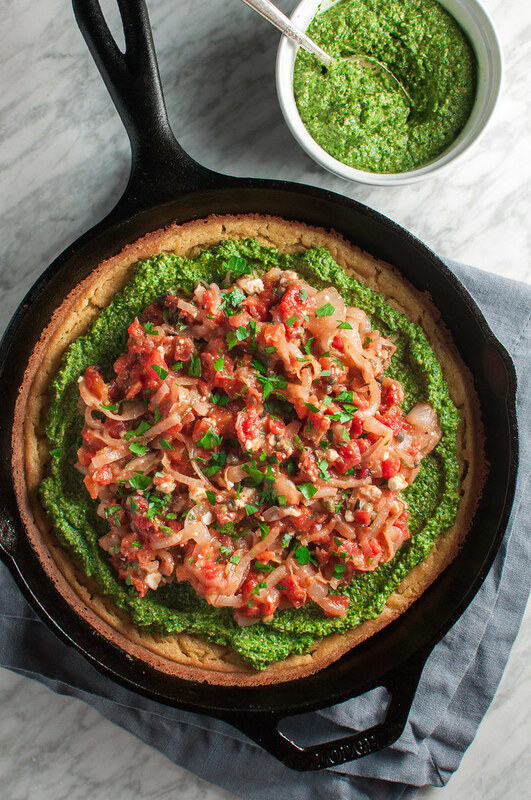 So there you have it: Spring skillet pizza with chickpea flour crust. There is one thing I couldn’t fit into the recipe title, though. This pizza is super healthy! It’s gluten free, the pesto is vegan thanks to magical creamy hemp seeds (which you can find even at Trader Joe’s), and the whole thing is vegan if you omit the sprinkle of feta to no detriment whatsoever. Me? I like a little cheese in just about everything, but the creamy pesto and tangy capers combined are more than sufficient to compensate for no feta. The hubs and I have company coming into town this Friday–my dad! He’s joining us for his second annual Five Boro Bike Tour in NYC, and instead of volunteering this year, I’m riding. Mostly it’s just to avoid the 4 AM volunteer report time while still participating. I really wanted to make this pizza/farinata as brunch for company, but because of our city escapades, we will unfortunately not be home except for Friday night’s dinner. Please make it for me instead? In other food musings, I’m deciding on (aka have not started thinking about) the menu for Friday night, when we’ll celebrate my littlest sister’s 27th b-day a tad late. I’m contemplating a giant pan of mac and cheese, but I kind of feel I should do something more springy and healthy, especially 36 hours before I ride a bike for the first time in eight years and make a comeback in grand fashion: 40 miles. Uff-da. And also, that was a lot of numbers. Whatever happens food and bike-wise, I’ll try to keep updates going, mostly on Twitter so as not to pollute my Instagram feed with poorly lit photos of post-race eggs benedict and rosé. Have a delicious week! Gluten free/vegetarian/vegan easily. 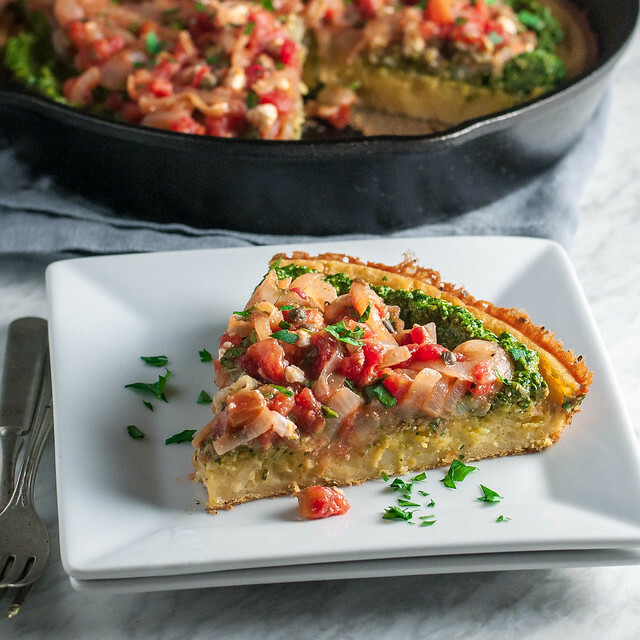 Chickpea flour makes the BEST gluten free deep dish pizza crust! Once you sink your teeth into this pie, you'll completely forget that it's pretty dang healthy. 2 to 12 hours before baking: In a medium bowl, whisk chickpea flour, salt, and pepper together. Continue to whisk while pouring in the water (all of it), then whisk in 3½ tablespoons olive oil. Cover and let stand at room temperature. To make the pesto, fill a medium mixing bowl with ice water and bring a medium pot of water to a boil. Add spinach and cook 30 seconds to a minute on high (even if the water doesn't return to a boil). Remove to the ice water for a couple minutes. Scoop spinach out and squeeze in your hands to remove as much water as possible. In a food processor, pulse the drained spinach, parsley, pine nuts, hemp seeds, lemon juice, and garlic until roughly chopped. With the processor running, drizzle in the olive oil until the mixture forms a smooth, thick paste, stopping to scrape down the sides of the processor once or twice. Pulse or stir in salt and pepper to taste. Preheat the oven to 425 (F) with rack in middle position. Heat olive oil in a 10 inch cast iron skillet or oven safe nonstick skillet over medium high heat. Add leeks and dried basil and cook until tender and beginning to brown, 8 to 10 minutes. Add tomatoes, honey, and a pinch of salt, stir, and simmer until slightly thickened and most of the liquid has reduced, about 3 minutes. Stir in capers plus salt and pepper to taste. Cool in a bowl 5 to 10 minutes, then gently stir in feta and fresh basil, if using. Wipe out the skillet with a damp cloth then place in preheated oven for 10 minutes. Give the chickpea batter a stir. Working carefully with the hot pan (the oil and batter will sizzle when added), remove it from the oven and coat with 1½ tablespoons olive oil (a basting brush works well). Pour in chickpea batter and return pan to the oven. Bake about 25 minutes, until set in the middle and lightly browned on top. Cool slightly. 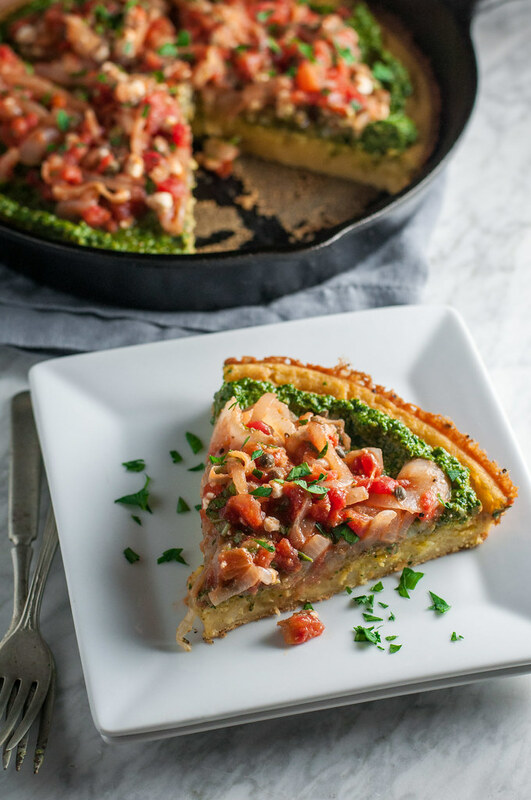 To serve, top the whole pie or individual slices with pesto and tomato leek sauce. If making ahead, serve at room temperature or gently warmed. The hemp seeds make this vegan pesto: they result in a creamy texture that traditional pesto gets from parmesan cheese. They're inexpensive at many grocery stores, but if you want you can substitute additional pine nuts or sunflower seeds. Meyer lemons are seasonal, so if you can't find them when you're making this recipe, substitute regular lemons plus a dash of pure maple syrup or agave nectar. I have a pretty big food processor so it works best when I make large batches of pesto in it. However, if you're working with a smaller appliance, feel free to halve the pesto recipe--you'll have plenty to top the pizza without leftovers. The pesto can be made a day or two in advance. Note: This page contains affiliate links. It does NOT contain sponsored content. Affiliate links (to products I recommend, on Amazon) offset my ingredient and website maintenance costs, so I can keep bringing you healthy pizza recipes like this one. Thanks!